Thank you very much for developing and maintaining the available software tools. In relation to my thesis I'm doing some simulations using the 5MW reference turbine, where I'm doing some condition monitoring. I have a few questions regarding Turbsim and InflowWind, since the various wind phenomena are important to my work. When simulating the reference turbine, the file named "NRELOffshrBsline5MW_InflowWind_12mps" contains the outputs Wind1VelX", "Wind1VelY" and "Wind1VelZ" by default. I'm unable to find anything in the documentation regarding what these velocities are equivalent to (Where they a physically measured). Are these computed on the nacelle, where Wind1Velx is equal to what an anemometer would measure? If not, how do obtain something equivalent? Edit: On further thought, the wind speed measured by an anemometer could be intrepreted as sqrt(Wind1Velx^2 + Wind1Vely^2 +Wind1Velz^2 ). I'm able to successfully generate different full-field wind data sets and run various simulations using these. Due to my inexperience with wind turbines and wind in general, I'm trying to figure out a best way to visualize the generated data. Also, since it seems that Turbsim uses various random events, see the figure below, which drastically changes the behaviour of the generated power. I'm hoping that the wind data can be visualized as some sort of 3D plot, any suggestions on how to achieve a visualization of the full-field wind data that makes sense? And is there a way to receive/output a summary of which randoms events occur at the different time steps? Any sort of help is appreciated. I'm sorry if the answers to my questions are very obvious, please forgive me if I have overlooked something simple. Regarding InflowWind outputs Wind1VelX, Wind1VelY, and Wind1VelZ, these are the ambient wind speeds (i.e. without the influence of the wind turbine induction / wake) at the 1st output point defined in the Inflow primary input file, i.e. the location defined in the WindVxiList, WindVyiList, and WindVziList lists. See the InflowWind documentation for more information: https://wind.nrel.gov/nwtc/docs/InflowWind_Manual.pdf. 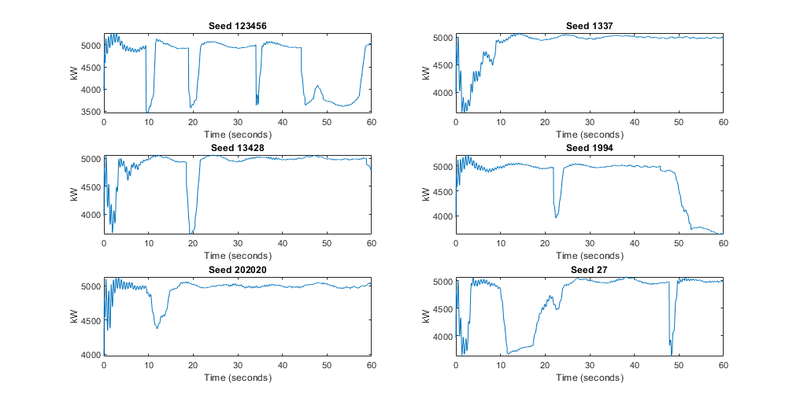 TurbSim uses random phases of the various frequency components (the random phases are established via the seed specified in the TurbSim input file), which determine (randomly) where gusts and other events occur in the turbulent time series. You can visualize the turbulence field by reading the wind data in the TurbSim-generated file into MATLAB via the MATLAB script named readfile_BTS provided in the MATLAB Toolbox: https://github.com/OpenFAST/matlab-toolbox. I have completely overlooked the locations defined by the WindVxiList, WindVyiList, and WindVziLists in the "NRELOffshrBsline5MW_InflowWind_12mps.dat" file. Sorry about that. Also thank you for the clarification regarding the random events which occur when generating the wind data using Turbsim. Regarding the readfile_BTS script, I encountered a similar script which was included with the installation of Turbsim. Though, I'm not quite sure what the best approach is to visualizing resulting data, which is in the form of an 4-D array. Ideally I would like some sort of 3-D plot, where it is possible to visually see at what times the gusts and other events appears. I really appreciate your response, once again thank you. I asked Bonnie Jonkman of Envision Energy about this, and she created a simple MATLAB function that creates separate 3D color plots (time, Y, Z) for each velocity component (u,v, w; the u-component is likely most influential to the turbine response). She has shared the MATLAB function here: https://github.com/bjonkman/matlab-tool ... d_figure.m. Thank you and Bonnie for this, this will definitely be helpful. I really appreciate the help.